I can't believe it has been over three years now since I last added a Jimmy Howard card to my collection. Between the multiple breaks I took from collecting and the Wings bouncing between Howard and Mrazek, I guess this project just became a lower priority. He is still my favorite current goalie so I don't plan on giving up on this project or anything like that. Thanks to my recent 50/50 trade with Chris from The Collector I now have this awesome new 2013-14 Score base card to add to the mix. I usually don't buy single base cards like this because the shipping isn't worth it and his stuff is always overpriced at and of the Detroit area card shows I go to. Getting this in a trade is the perfect way to go. 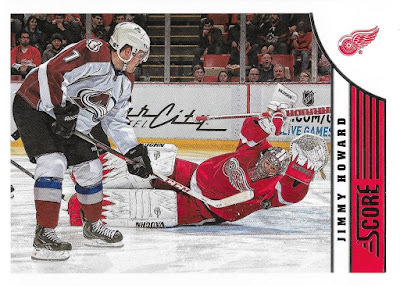 I love the photo on this card as it shows Howard diving to make a save on what appears to be a breakaway for the Avalanche. Not sure if he mad the save or not, I'd have to try and track down the highlights for that particular game to find out. I'm not really sure where this puts me as far as the number of cards in my Howard collection, so that is something that I need to figure out one of these days. Then I need to work on tracking down the other versions of this card: Red, Gold, Black and Red Back. Base cards are the biggest portion of all my player collections and it's always nice to have a variety of designs and photos for a given player. Base cards are great for that.